With the price of gasoline nearing $4.00 per gallon in most parts of the country, some people are taking extreme measures to save money on gas. There are alot of ideas out there that claim will help you save a pocketful of money on gas. Do these ideas really work? 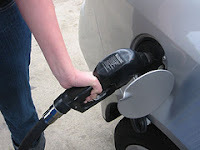 CNN Money looked at six common misconceptions of ways to save money on gas. 1. Fill your tank in the morning. This is one that I've heard alot and would actually do this before gas prices started the upward climb. The theory is that fluids are more dense at lower temperatures so a gallon of cold gas has more molecules than a gallon of warmer gas. According to Consumer Reports, the temperature of the gas as it comes out of the nozzle varies very little during the course of the day so there is little benefit to waking up early to fill up the tank. 2. Change your air filter. Not to say that you shouldn't change the air filter in your car but it won't save you money on gas. Computer sensors in modern engines are able to adjust the fuel-air mixture if a clogged filter is choking off proper air supply. A clogged air filter will probably reduce engine power but lack of performance or an increase in fuel consumption will be minimal. 3. Premium fuel. Newer cars that "recommend" premium fuel probably won't suffer using regular fuel. Again, computer sensors in modern engines are able to adjust spark plug timing when they detect the use of regular fuel. You'll experience a slight decrease in horsepower, but you'll hardly notice it. The savings between the price regular vs. premium fuel to me, is worth a small decrease in horsepower. 4. Pump up tire pressure. Underinflated tires cause uneven tire wear, is bad for handling and could cause a dangerous tire blowout. The key is to have your tires properly inflated. Don't be tempted to overinflate your tires to save money on gas. You'll save a little money on fuel economy because there is less tread touching the road thus creating less friction. You may gain an extra mile per gallon but the risk of having an accident is just not worth it. 5. Run A/C or not. Using the A/C while driving makes the engine work harder and increases fuel usage but having the windows down at highway speeds creates a drag and makes you use more fuel. The best choice for highway driving is to leave the A/C compressor off and run the fans and let in air from the outside if temperature and humidity are low enough so that you are still comfortable. If you are riding around town, it is best to use the windows. 6. Bolt-ons and Pour-ins. Bought a device or fuel additive that claims to improve fuel efficiency and gas mileage? If it was this easy, fuel companies and automakers would probably be doing all they can to compete with competitors. Some drivers who use them swear they work. Consumer advice editor for Consumer Reports, Phil Reed, thinks it's probably a placebo effect. People who've installed a device to increase fuel efficiency or buy additives to save money on gas probably pay more attention to fuel economy and how they drive. Do you use any of the above to save money on gas? Reminder: Please take a moment to subscribe to SingleGuyMoney. I'd like to point out that, besides costing more, premium fuel can actually reduce fuel mileage. I had a '90 Accord, back when I believed that premium was always better. On premium, it consistently got 22.5 MPG . When money got tight I put in regular -- and got 25 MPG . An 11% increase. The thing about air pressure that always bugged me. The recommended pressure was for stock tires. When you have a car long enough to put two or three sets of tires typically you don't stick with stock tires. Lots of times those tires aren't made anymore. So you change tires, same size but different max inflation rates, different driving quieter / noisier, stiffer softer. So what is the "proper" tire pressure? Me I run two pounds under whatever the max tire pressure is on the side of the tire. Which is 5-10 pounds more than the recommended inflation rate of the car manufacturer. Result (knock on wood) other than driving on snow when the lower tire pressure is a definite advantage. I get the max EPA rating out of my car in mixed driving, even wear, max tread life plus and so far no problems.